Please see start times by age group below. The start is located at the intersection of Robin Rd. and Upper Park Rd. Join Miles the Bunny and his friends for a morning of fun and fitness. 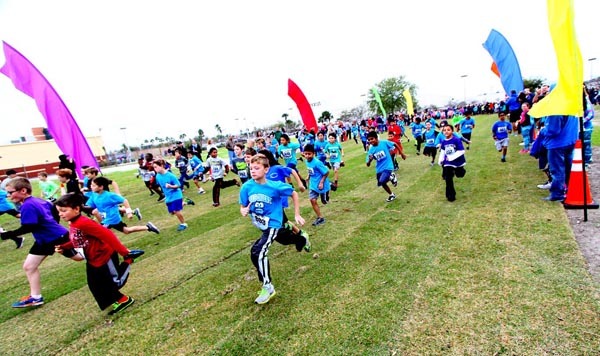 Smile Mile is a one mile running festival for children ages five to eleven. All times are a.m. & subject to change. *Participants must report to the start 15 minutes prior to their race time. In honor of a dedicated coach and father who motivated so many young runners, the Coach “Sly” Johnson Participation Award goes to one school from each county with the most runners participating! To qualify a school must have a minimum of 25 runners participating. School counts will be based upon registrations received by Friday, March 1st. A $500 grant and plaque will be awarded to the winning schools. Qualifying/top schools from each county information coming soon! For safety reasons, parents, guardians, baby joggers/strollers, bicycles, rollers skates, in-line skates, and dogs will be prohibited from the race course. The use of headphones is discouraged.